You don’t have to be READY for fall to dream about it. This Fall Nesting party is not only for people who are already hanging acorns across their mantle. Even if it is 109 degrees where you are, you can still dream about what you WILL do or WANT to do once the mood really strikes! As part of our “Fall Nesting Party” extravaganza (which starts September 2), you — my lovely and faithful readers, even my Fall Nesting naysayers — will have a chance to win a $200 Shopping Spree Gift Card to HomeGoods (TJ Maxx). But not just one of you will win. No, no, no. THREE OF YOU will win. Yes, I’m giving away THREE 1-2-3 $200 gift cards, courtesy of my friends at HomeGoods. So how can you win a gift card to Homegoods? Well, you are going to have to prove to me you REALLY WANT this gift card. You can beg. You can plead. You can send me chocolate and Starbucks cards. You can vote for me. You can spread the word far and wide about the Fall Nesting party. That is a start. But mostly you just need to show me which room or area in your house needs a boost and what you would do with a $200 HomeGoods card. It is that easy. Ok, so how will I get your entry? If you have a blog, go ahead and take a photo or two of what room you want to work on this fall, write a post about what you’d do with the gift card, and then link up the post to the Fall Nesting Party any time this week. Just make sure your posts mentions you are trying to win the gift card so I know to count your entry! And if you don’t have a blog or this type of post would not fit with your topics, you’ll just have to email me the photo of the room you want to work on and a description of how the gift card would help! NOTE: If you email me, put HOMEGOODS ENTRY in the subject line. My inbox is overflowing and I don’t want to lose your entry!! Once I have a chance to see all of your entries, I will select THREE of you to head off to a HomeGoods (TJ Maxx) near you with a $200 gift card in hand! HOW MUCH FUN will that be? I wish we could all go together but we can do this virtually! Then, if you want to show off what you bought and the room you made over, I’ll share it here on The Inspired Room or send people to your blog to check it out what you all found. Now, get nesting. September 2 is the start of Fall. Thus sayeth The Inspired Room. HomeGoods is giving away shopping sprees every day on their blog too, so go take your “StyleScope” quiz, developed by Deborah Needleman (the founding editor-in-chief of Domino Magazine) to enter and find out what YOUR style is! All the green in this room makes me happy — HGTV 2008 Green Home. I‘m big on taking baby steps. I am not so good at huge long range plans and goals or charts to motivate me. Clearly I am easily overwhelmed by too many expectations. Eh hem. When I want to change my attitude or get myself motivated for something, I concentrate on little things I can do today to make a change. I have to focus on the little things. Fall Nesting parties make me happy. 2009 The Inspired Room. I am going to confess something. Lean in a little closer…(shhhh) gearing up for fall nesting is really hard for me this year. Seems strange for me to say it is difficult as I ADORE fall. I look forward to it every summer. Here is why this year is tough — I am beyond busy with the church that we are starting in two weeks (but of course, very excited about it too!). My house is filled with musical instruments, kids toys and equipment and church coffee pots. It is hard to find a chair to sit on, let alone make a room pretty for fall. I’m so busy with all the church preparation that housekeeping and decorating has fallen by the wayside. I just shuffle boxes from room to room. In addition to a busy life, this fall is also difficult because I am not sure where we will be living after this month. It is a long story if you haven’t heard it (I’ll be sharing the whole story over at (in)courage later in September for anyone who wants to read it). Basically my home situation in limbo and we need to be prepared to possibly move in thirty days. Even if I end up staying here, it may still only be for a few more months. What fun is decorating when you aren’t sure you are in your permanent home? What fun is nesting when you are broke? What fun is fall nesting when you are tired and your life is focused on other things more weighty than nesting? Well, I don’t want to be a whiner. I can’t let all those things discourage me from things I love about my life. I need to enjoy my fall nesting rituals in spite of the circumstances that threaten to derail my happiness. ENJOYING fall is part of who I am and I am determined to embrace it! I need to make whatever adjustments I need to, get creative within the limitations of finances, and push past the uncertainty and unknown. I need to make time for the things in life that make TODAY better. So in the spirit of finding things I could do TODAY to lift my spirits, I decided to take some time out for a creative project. Creativity makes me happy. No, I had no time to do this but it was important to my well-being. It was a little thing I could change TODAY. A sad, pathetic down-in-the-dumps bird cage. It took me awhile to come up with something non-permanent to work on around the house (in case we have to move), but as I walked out onto my porch I saw my pathetic looking birdcage. It has been crying out for a coat of paint for five years. I’ve hated it ever since I found it. Now it was finally time to make it the happy little bird cage it deserved to be. And it made ME happy to see it all bright and pretty instead of scary old and pathetic. Hmmm….I think there is a parallel here somewhere. A brighter, more happy bird cage. While I am on the topic of positive attitudes, I was recently introduced to a new community starting up over at Divine Caroline called You.Propelled. Propel’s mission is to enhance your life, give you the ability to move through obstacles and live a more streamlined, energetic life. Yep, I need that. I get asked to be a part of many different communities and I am always very selective about what I will be involved in. I knew You.Propelled was something I could share with you because I too am a big believer in not letting life’s difficulties or circumstances get you down. We all have choices for what attitude we want to have in life and the power to make changes TODAY. I encourage you all to check out all the inspiration at You.Propelled, whether you are wanting to turn over a new leaf this fall (no fall leaf pun intended, ha! ), exercise, lose weight, eat better, get organized or do something in life you’ve never done before, I know you’ll find a lot of resources there to help motivate you INCLUDING chances to WIN $5,000!!! That motivates me, I don’t know about you. I know this is a lot to ask on a Monday, but what are some easy ways you could make your life better TODAY? Let’s share some inspiration in the comments! Thanks to Propel for sponsoring The Inspired Room! I’m proud to be working with them on the You.Propelled project this fall. 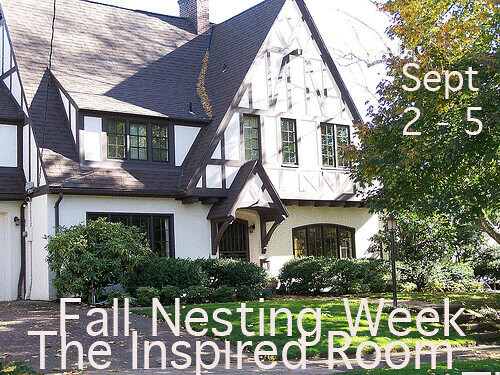 Don’t forget to do your Fall Nesting post to link up here on The Inspired Room on Wednesday September 2nd! Let’s get inspired by the season ahead!